iBottleopener Puts A 'Party In Your Pocket', And I Still Want One – Yeah, Buddy! From the I-did-not-know-I-needed-this-until-I-saw-it department: meet the iBottleopener, a special iPhone case for the 3G and 3GS model that is both a protective case and – drum roll – a bottle opener. Its maker, Santa Barbara-based Lightbulb Moments, says the thing is patent-pending, which they hope will make you more willing to cough up $20 (plus a $4 shipping fee) for it. 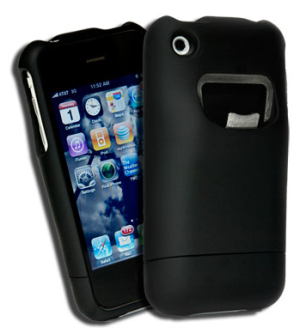 An iPhone 4-compatible version of this wonderful invention is supposedly coming soon.